Boston Amateur Boxing Club fighters featured on four shows in two days. On Friday evening in March, Connor Brazil made his debut against Josh Hartley of the Sheffield Boxing Centre. Connor fought with patience and aggression as he took the fight to the Yorkshire boy. Lead hand shots to the body with back hand hooks to the head were hitting home and swung the bout in his favour in a good contest he won on a split decision. 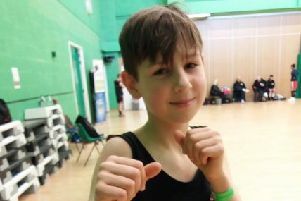 In Hull youngster Tyler Dent met local fighter Kein Patel of the St Paul’s Boxing Academy. Tyler boxed well using his long range attacks, frustrating the shorter Patel. The bout was in the balance as round two was just about to come to a close when a low duck defensive move with a quick elevation from the Hull fighter saw his head clash with Tyler’s nose, the Boston lad unable to continue. In Grantham on Saturday, Coby Brown was rematched against Imps ABC’s Levi Ward. Learning his lessons from the previous encounter, Brown stood tall and boxed off using pressurised attacks and movements to good effect as he looked in control after the first. The second saw more urgency from Ward. It looked all in the balance going into the final round, Coby landing the harder telling punches and Ward the flashier shots. It was a close fight that the judges awarded to the Lincoln boy. Harem Ali was matched against Adnan Khan of the KBW ABC. It took Harem a while to get going in the opening round with Khan using his quick hands to impose his style. Harem had the measure of his man in the second round as he began landing flush hurtful shots on his Yorkshire opponent, causing him to hold and cling on to prevent Harems attacks. A big last round was ordered from the Boston corner, which Harem duly gave. Persistent holding continued to go unpunished from the referee, frustratingly for the Boston lad as he saw the decision go in Khan’s favour.